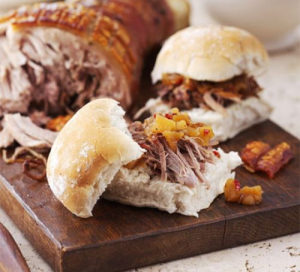 Our ‘do it yourself’ hog roast is perfect for events, parties, celebrations and gatherings. We supply and do all the hard work and you serve and enjoy! We supply either cooked and shredded (served warm) or uncooked rolled shoulder of pork, homemade apple sauce, stuffing, extra crackling and soft white baps plus the napkins and paper plates to accompany the meal. Need extra food to accompany your hog roast? We can also supply bespoke packages tailored to your needs including salads, sandwiches, sauces, deli meats and sweet treats. All the meat is cooked and supplied in foil trays and can be picked up in our thermal boxes. Prices start from £5.95 per portion, with a minimum 10 portion order. A £40 deposit is required per thermal box and is refunded upon receipt after your event. All bookings require a minimum 72hr notice.